In 2015, Sri Lanka co-sponsored United Nations Human Rights Council (UNHRC) Resolution 30/1 and committed to a range of measures on human rights, accountability and reconciliation. Sri Lanka’s progress in fulfilling its commitments under this Resolution will be discussed on March 20, 2019, at the 40th session of the UNHRC. 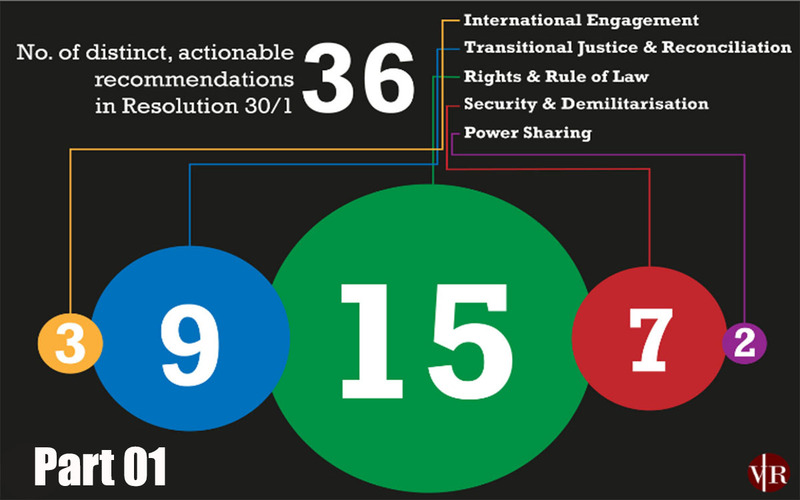 Resolution 30/1 contains 36 actionable commitments, which maybe categorised under five themes; (i) transitional justice and reconciliation, (ii) rights and rule of law, (iii) security and demilitarisation, (iv) power sharing, and (v) international engagement. Since 2016, Verité Research has annually assessed government progress in fulfilling these commitments. According to Verité’s assessment as at March 2019, the government has fulfilled 6 out of 36 commitments. This article is the first in a four-part series that presents progress as at March 2019. It focuses on the areas of transitional justice, reconciliation, and power sharing. The government made nine commitments on transitional justice and reconciliation. 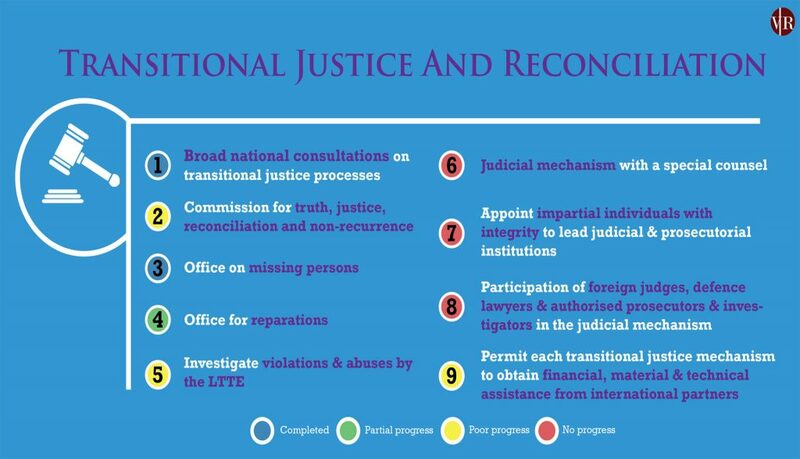 These include establishing four transitional justice mechanisms; an Office on Missing Persons (OMP), an Office for Reparations, a Commission for Truth, Justice, Reconciliation and Non-Recurrence, and a Judicial Mechanism with a special counsel. After several months of delay, the Office on Missing Persons (Establishment, Administration and Discharge of Functions) Act, No. 14 of 2016was passed in 2017. The OMP became operational during the following year. Its key activities over the past year included collating information on missing persons, consulting families of the missing, and formulating recommendations to provide relief and justice to victims. The OMP reported that it received over 13,000 files on missing and disappeared persons from the Ministry of National Integration and Reconciliation and is in the process of developing a centralised list of missing and disappeared persons. It has also begun setting up regional offices around the country, beginning with an office in Matara established in March 2019. Progress on other reconciliation mechanisms has been slow. A law establishing an Office for Reparations was passed last year. The mandate of the Office for Reparations is to facilitate individual and collective reparations for ‘aggrieved persons’. The Office is yet to become operational. The government also committed to establishing a judicial mechanism with a special counsel to investigate violations of human rights and international humanitarian law. This commitment specifically refers to the participation of foreign judges and lawyers in the mechanism. However, over the past four years the government has maintained that it will not include the participation of foreign judges. Commitments relating to the special judicial mechanism therefore show ‘no progress’ as at 2019. The government made two commitments on power sharing; to ensure a political settlement through constitutional reform, and to ensure full implementation of the 13th Amendment to the Constitution. As at March 2019, neither of these commitments were fully implemented. A constitutional reform process began in 2016.The Constitutional Assembly was created in March 2016, and a steering committee was appointed to prepare a draft constitution. In January 2019, a Panel of Experts appointed to advise the Constitutional Assembly released its report on proposals for a new constitution. However, an official ‘draft constitution’ is yet to be compiled. Meanwhile, the government lost ground in fulfilling its commitment to ensure full implementation of the 13th Amendment to the Constitution over the past year. 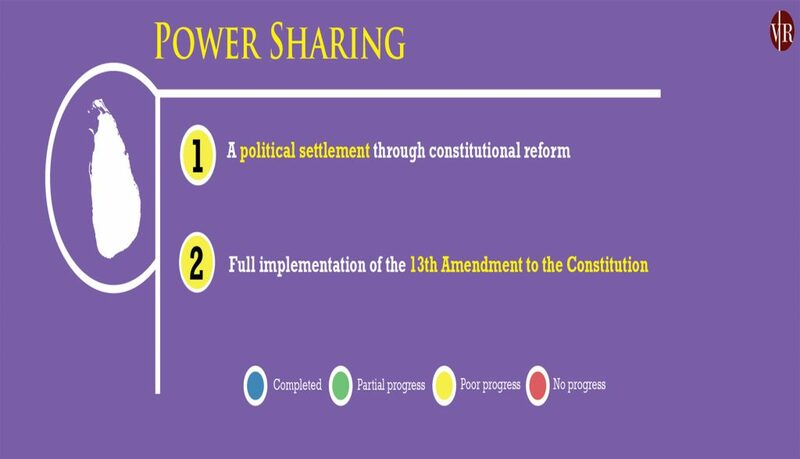 The 13th Amendment introduces a system of power devolution to the provincial councils. In 2017, the government introduced changes to the provincial electoral system. These reforms require constituencies to be re-demarcated before fresh provincial elections can be held. Delays in the re-demarcation process have resulted in delays in holding provincial council elections. Currently, provincial council elections are overdue for six provincial councils, and the terms of the remaining three are due to expire in 2019. The commitments discussed above represent the key features of Sri Lanka’s agenda on accountability and reconciliation. The government’s overall progress in fulfilling these commitments has been limited, with only two reaching completion thus far. The past year saw improvements in terms of two of the four transitional justice mechanisms: the OMP and the Office for Reparations. The government however, lost ground on its commitments on power sharing due to delays in holding provincial council elections. (This article will be followed by updates on the other categories under Resolution 30/1 over the next week).